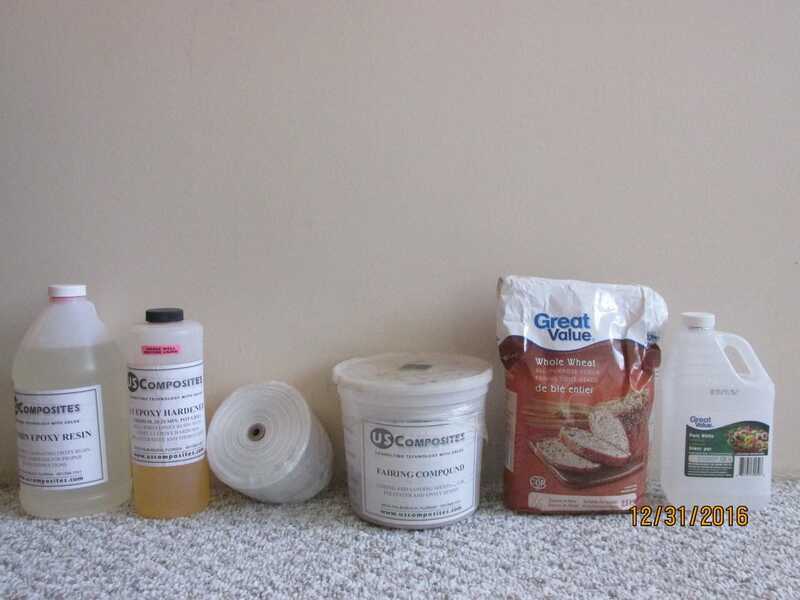 Left to right: Resin, Hardener, Fiberglass Tape, Fairing Compound, Bread Flour and White Vinegar. We buy all our fiberglass supplies from US Composites (www.uscomposites.com) - the best prices and service in North America. They ship from their warehouse in Florida. For our climate we use thin epoxy resin with medium hardener mixed in 3:1 ratio (3 parts epoxy and 1 part hardener). For fiberglass tape we use 3"(75mm) wide tape by 8.7 ounce(280 gr/sq.m). We buy complete 50 yard(45m) rolls. Fairing compound is added to the mixed epoxy with hardener to make fairing putty for final fairing of the boat's hull. Bread Flour is mixed with epoxy and hardener to make a structural fillet along the seams of the boat. White Vinegar mixed with warm water 50/50 is used to clean surfaces before glueing or applying fiberglass. 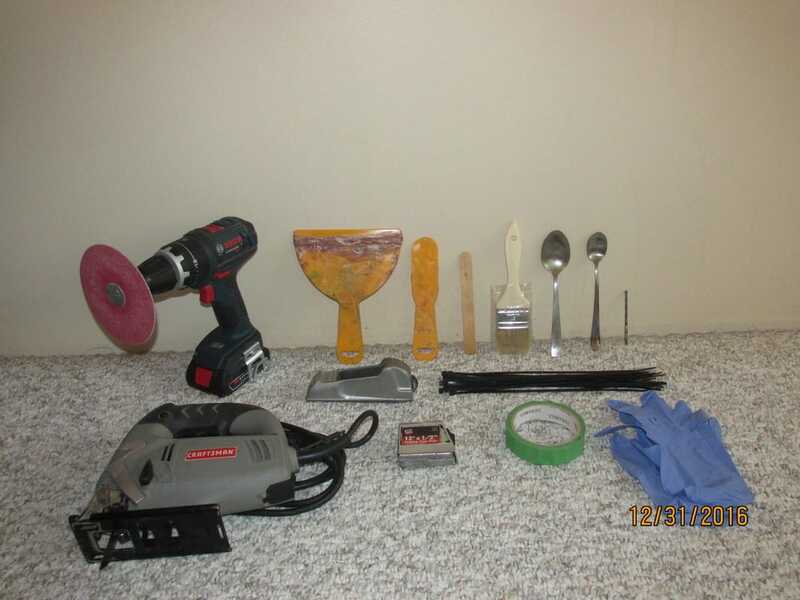 Left to right: Drill with 50 grit fiberglass disk attached, 6"(150mm) wide squeege for spreading fairing putty, narrow squeege rounded to 1.5"(40mm) diameter for shaping larger radius fillets, mixing stick also used to shape smaller fillets, disposable chip brush, spoon for measuring larger batches of epoxy and hardener, smaller spoon for measuring smaller batches of epoxy and hardener, drill bit 1/8" diam. (3-4mm), rasp plane (very useful tool), zip ties, jig saw, tape measure, masking tape and gloves. I remember when we built our first "Colibri" dinghy we used a hand saw to cut out all plywood panels, it's a good exercise and the cuts are amazingly straight and fair. The 50 grit fiber disks we buy at Home Depot are superior. They are attached to a rubber disk and used mostly to knock down and taper the edge of the fiberglass tape. Mixing sticks are tongue depressors which are also ideal for making smaller radius fillets. 2" chip brushes are bought in packages of 5pcs. from Home Depot. They are used for applying epoxy resin and wetting out fiberglass tape. The Dollar Store is also a good place for cheap disposable brushes. We find metal spoons easiest to measure batches of epoxy and hardener. Plastic disposable spoons tend to break after several uses. Just pour the resin from the bottle to the rim of the spoon, then place in a mixing cup (plastic yogurt containers). Do this 3 times. Then wipe the spoon with a rag and pour the hardener into it. Place in the mixing cup and mix for at least 1 minute. Zip ties used to stitch up the hull should be at least 10"(250mm) long. The Stanley rasp plane is superior for filing plywood edges, rounding corners and knocking down hardened epoxy.